At Shot Show this year SIG Sauer came out with a ton of new products. But one thing that kind of slipped through cracks and didn’t get talked about a whole lot is their new line of ammunition. 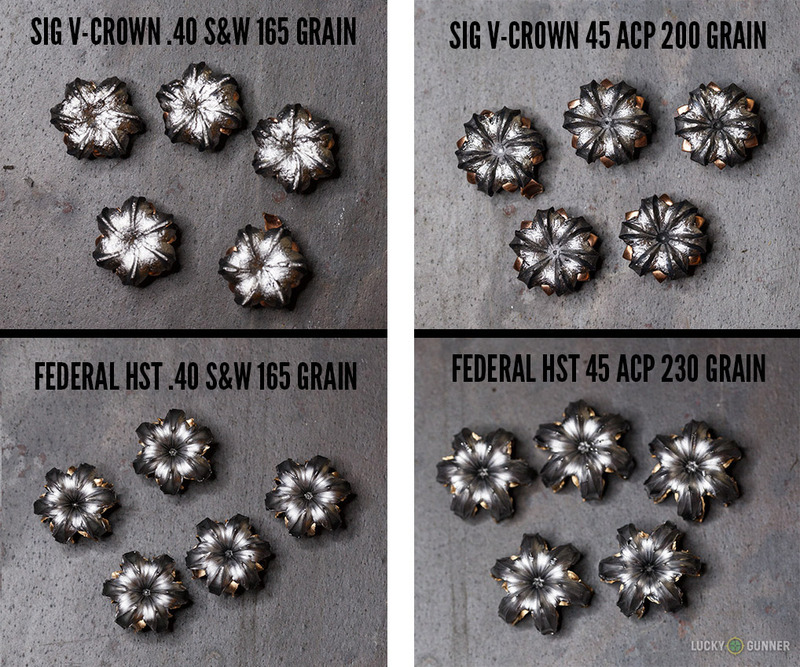 Now SIG has made ammo before in the sense that they’ve helped develop loads like, the 357 SIG. But they’ve never actually manufactured ammo until now. Now This is SIG made ammo, it’s just somebody else’s ammo with the SIG branding slapped on it. It’s made a facility that they have in Kentucky. And for now they’re doing five handgun calibers, and it’s all hollow point self-defense rounds with a bullet they’re calling the V-Crown. The very first batch of it just went out last week and we’ve got some in our store right now. I grabbed a few boxes of it and went out to the range to test it so you guys could see what to expect from it. I put a lot of data and information from that testing, along with some photos, in today’s blog post. But just as a general summary the ammo seemed to perform pretty well from a reliability standpoint. It was fairly accurate. And I also shot a few rounds of each caliber into some ballistics gelatin. This is the first time we’ve tried this before. I haven’t done any ballistics testing in the past. But I think we got some pretty good information out of it. For comparison, I also shot a few rounds of some competing loads so you can see how they perform against the SIG loads. Now I know ballistics expert, scientist, or anything like that, so you can take all this with a grain of salt. But we do have the FBI standards that we can compare this to that might give us some idea, with the gelatin, of what to expect in real life performance. If you have no idea when I’m talking about, I’ve linked a couple of articles in today’s blog post that should explain that a little better. But the basic gist is that, in the ballistics gelatin, you want to see expansion of the bullets and you want to see penetration. So with the expansion, all of the bullets from Sig expanded pretty well, pretty consistently. The penetration on the other hand was not quite what we want to see. The 45 performed pretty close to the comparison round, but the 40 Smith & Wesson was a few inches shy of with the comparison round was able to do. Now it was still over the FBI standard minimum of 12 inches. So that’s still pretty good. But the 380 and the 9 millimeter we’re not quite as impressive, they both penetrated to right at 9 inches. Now for 380 that’s about as much as you’d expect to see. It’s just not a very powerful round. It’s not something that penetrates to 12 inches very often, no matter with a load is. For the 9 millimeter it’s a little disappointing. The comparison round went to 13 inches, which is four inches more. And that’s more along the lines of what you would want to see from a 9 millimeter. I would say, at the end of the day, what really matters is your ability to get shots on target quickly and accurately. That’s going to matter a lot more than your load choice or even your caliber choice. But if you like to SIG ammo it seems to perform pretty well in terms of just reliability and accuracy. So if that’s what you like then just put it in your gun and forget about it, and think more about just increasing your own performance so that you can put hits on target if you really have to. You may have missed it since Sig hasn’t made any real announcement yet, but Sig Sauer is now officially in the business of making ammunition. They’re expected to launch some official publicity in the coming weeks around the time of the NRA Annual Meetings. The new Sig Sauer Elite Performance self-defense ammo comes in five different handgun calibers: .380 ACP, 9mm, .40 S&W, .357 Sig, and .45ACP. Each caliber features a single load and bullet weight using Sig’s proprietary “V-Crown” bullet, all with standard pressure (no +P loads). The ammo is loaded in a Sig-owned facility in Eubank, Kentucky. We got in some of the first batch of Sig Sauer ammo last week, and the .45 ACP and .357 Sig have already sold out. But before we posted it for sale, I grabbed a few boxes to do some testing for those of you who might be curious about what this ammo can do. If you want the short version, just watch the video summary above. The rest of you number loving ballistics nerds can read on for all that spreadsheet goodness I know you crave. How does it perform compared to other available self-defense loads? To answer these questions, I fired groups for accuracy, measured velocity on a chronograph, and observed the performance of each load in ballistics gelatin. In the interest of time, I skipped over the .357 Sig load since it’s the least popular of the five calibers. If there are enough requests from you guys, I’ll re-visit that load in a future post. For comparison in the ballistics gel, I also tested loads from a second brand of ammo for each caliber. I used the popular Federal HST self-defense ammo as the counterpart for the 9mm, .40 S&W, and .45 ACP loads. 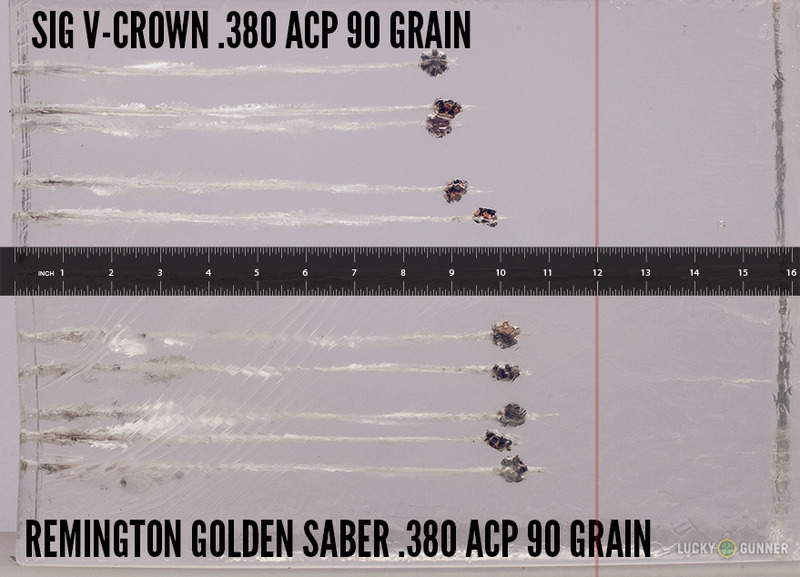 For .380 ACP, I used Remington Golden Saber as the comparison load. 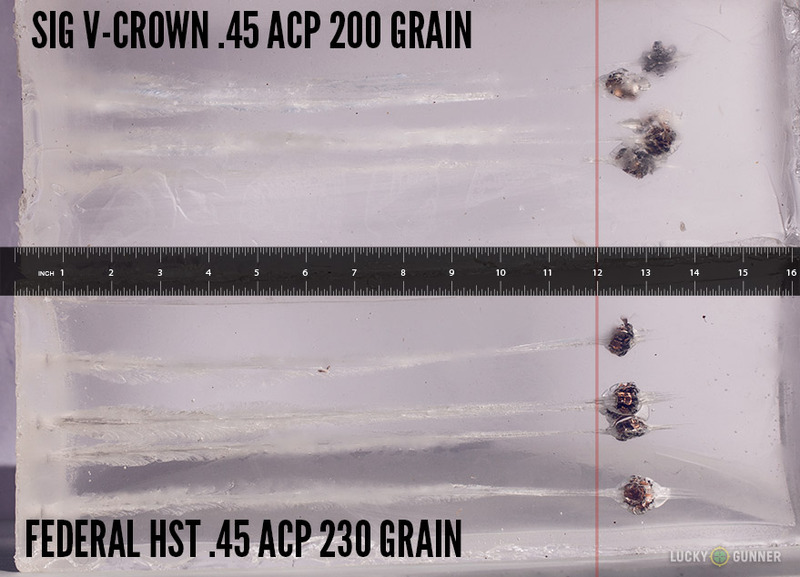 None of the test guns exhibited any feeding problems or malfunctions with the Sig V-Crown ammo. 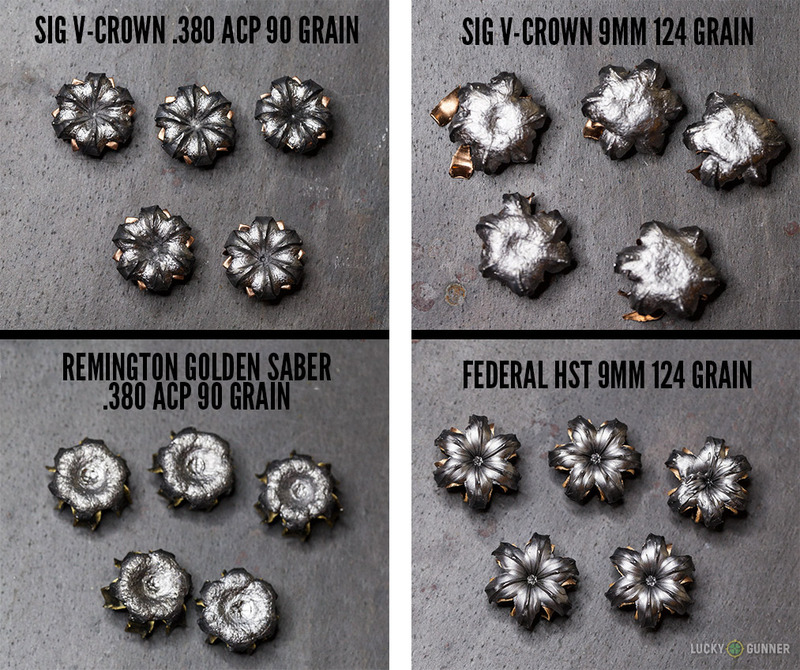 The Sig V-Crown bullet has a wide opening relative to many other modern hollow-point loads. It somewhat resembles the Federal Hydra-Shok self-defense ammo. Some pistols may have trouble feeding this kind of ammo. If your gun has had reliability problems with Hydra-Shoks in the past, I wouldn’t be surprised if the Sig ammo exhibits similar issues. Sig Sauer V-Crown ammo from left: .380 ACP, 9mm, .40 S&W, .45 ACP. On each load, the V-Crown bullet has a relatively wide mouth, most likely to aid in bullet expansion. For accuracy, I fired one 10-shot group for each load from a bench rest at 15 yards. Those results are on the table below. These numbers are all fairly consistent with the kind of accuracy I’ve come to expect from each of these pistols. The Glock 22 with the Lone Wolf 9mm conversion barrel has never been a particularly accurate setup for me, so better groups should be achievable with a more accurate gun. Unfortunately, the only other pistol I had available at the range that day was a S&W M&P9, which would have most likely grouped even worse. This test was intended to be a quick overview to spot any glaringly obvious flaws or problems with the ammo. For self-defense purposes, the Sig Sauer V-Crown seems to perform just fine in the accuracy department. For the ballistics test, I used blocks of gel from Clear Ballistics. Their synthetic gel substitute is made to simulate the properties of the traditional organic-based ordnance gelatin the FBI uses for testing ammunition. If you’re not familiar with the FBI testing protocols, there is a lot of great information available on the subject, but in the most basic terms, the gel testing is used to determine whether the bullets will penetrate and expand when used to defend against an attacker in a life-threatening assault. Before we dive too far into the minutiae, let’s just remember that handguns are notoriously terrible at stopping bad guys. I’ll link to this article by Greg Ellifritz one more time because it explains the topic better than I ever could. If this topic interests you enough to have read this far, I encourage you to read Greg’s article in its entirety (you’ll totally miss the point if you just skim it). We carry handguns because they’re convenient, not because they’re the best defensive tool we have. Now with that out of the way, if you are forced to rely on a handgun to save your life, you want to get every possible advantage you can get. That’s why we like to see how our handgun ammo performs in ballistics gel. The FBI has established 12-18 inches of penetration into ballistics gel as the ideal standard for law enforcement duty ammunition.That’s not just an arbitrary number; handguns are effective at stopping bad guys only if their bullets strike and disrupt vital organs that essentially “shut down” his system so he can’t hurt you anymore. 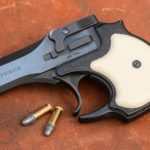 To do this, the bullet has to burrow through a lot of soft tissue (as well as bones and clothing and whatever else may be in the way), and that’s where the 12″ minimum comes from. More than 18″ of penetration, and there’s a risk of over-penetration. That happens when the bullet passes all the way through the bad guy and still has enough energy left to harm innocent by-standers. The gelatin used in these tests is not a perfect analog for human tissue, but it’s about as close as we can get practically and still achieve repeatable results. Testing bullets in other mediums like food-grade gelatin, water jugs, wet newspaper, or hunks of meat might be better than nothing, but the results are difficult to interpret in any useful way. Ballistics gelatin has been used as the industry standard for many years, and there’s a large body of existing data to use for comparison. 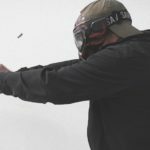 For a more comprehensive test, ballistics gel is often used along with different barriers to determine how the bullets behave when they encounter fabric, plywood, and glass before striking the target. My tests were only performed on bare gelatin with no barriers. Penetration and expansion of each load may look significantly different in a test with a few layers of denim placed in front of the gel. In testing the Sig Sauer Elite Performance ammo, I fired five rounds of each caliber in to a 16″ long block of Clear Ballistics gelatin at a distance of 10 feet. A fresh block was used for each load. I did the same for the four comparison loads. The .380 ACP and 9mm loads were tested with the gel blocks as they came shipped directly from Clear Ballistics. I melted and re-molded these blocks after the first round of tests according to the instructions from Clear Ballistics. The .40 S&W and .45 ACP ammo was then fired into these re-molded blocks. In the photos, you can see that the blocks from the second batch aren’t as clear as the first batch. That’s because I wrapped the blocks in paper for transporting them to the range, which gave the blocks a cloudy appearance when the paper was removed. The consistency of the gel was not affected. After firing into the gel, I measured the penetration depth of each round, and then retrieved the fired bullets from the gelatin. The expanded bullet diameters listed below are an average of each of the five bullets from each load. Measuring the penetration depth can be a little tricky sometimes. The gel causes some optical distortion, much like looking through aquarium glass. I measured the penetration depth from multiple sides of the block to minimize this effect. I measured each along the trajectory of the wound channel since not every round hit the gel at an angle perfectly parallel to the orientation of the block. Because of this and the visual distortion of the block, it is not possible to get a 100% accurate reading of the penetration depth just from looking at the two-dimensional photos below. In the photos below, you can also see where the bullets traveled a bit further than their final resting spot, but “bounced back” in the gel before coming to a complete stop. The additional travel looks to be anywhere from one half to a full inch in the gel for each bullet. I could not find any reliable information regarding whether this portion of the channel should be included in the penetration depth measurement, so I have left it out. My measurements start at the entry point on the block, and end at the far end of the bullet’s resting point. I’ll refrain from giving any hard recommendations based on this data. This is my first substantial and relatively in-depth attempt at ballistics testing, and there are a few things I will do differently next time. That said, I think the data I gathered for the Sig ammo is pretty solid, especially when compared solely to the competing loads of each caliber. 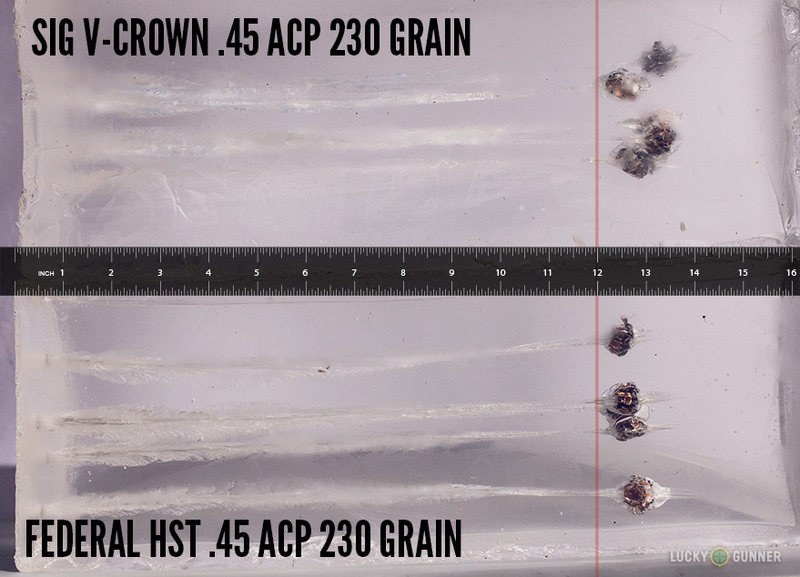 As you can see, the .45 ACP Sig Elite Performance performed closest to its comparison load out of all the Sig ammo tested. Expansion of the .45 ACP Sig load was not as good as the impressive spread of the HST, but the average penetration depth was very close. 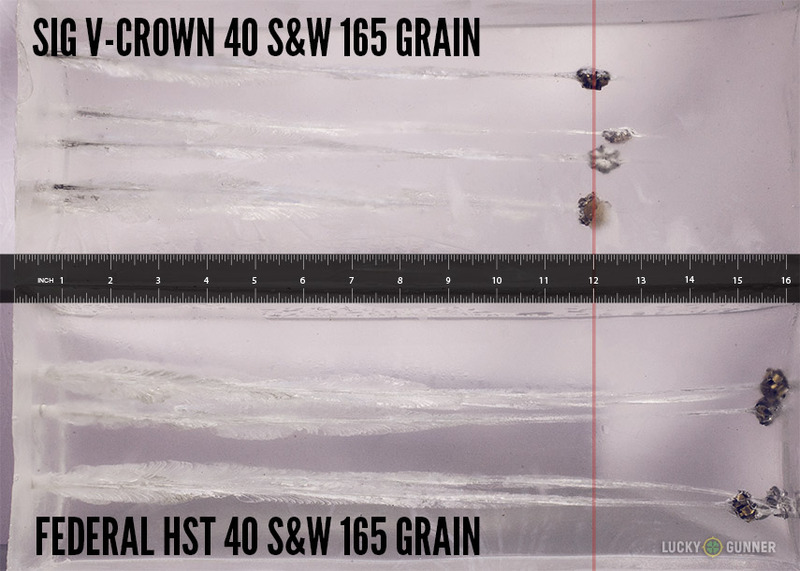 The .40 S&W load for the Sig ammo did break the magical 12-inch barrier, but was still significantly out-performed by the HST in terms of penetration. Expansion of the two was nearly identical. The 9mm performance was not especially impressive. 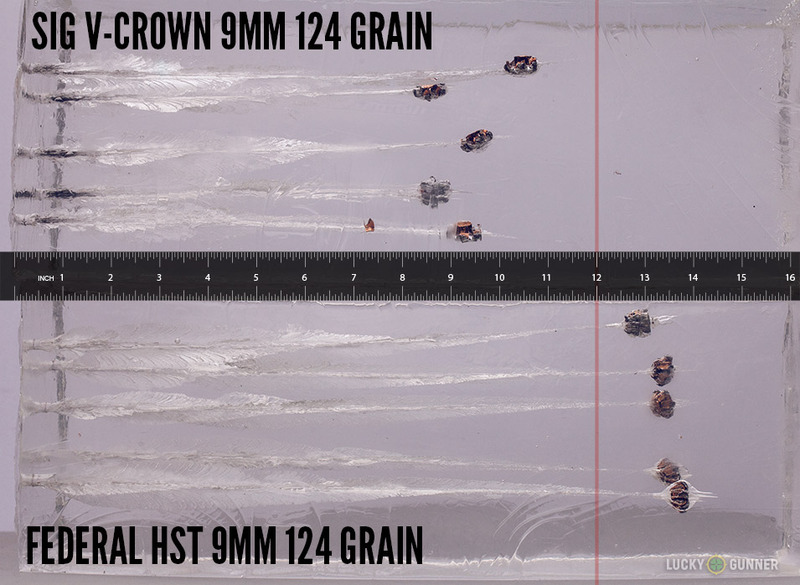 Sig Sauer’s 124 grain bullet only penetrated to an average of 9 inches compared to the HST’s 13 inches. Expansion was slightly greater than the HST but without more penetration, that doesn’t help a whole lot. The .380 performance was sub-par for both the Sig load and the comparison Remington Golden Saber. Very few loads in this caliber exhibit sufficient penetration and expansion, so these results aren’t especially surprising. Personally, I’m a big fan of 9mm in general, but based on what I’ve read in the past, I prefer the performance of 124 grain +P and 147 grain loads. So unless Sig comes out with something new in the future, I’m not changing the load that I carry any time soon. 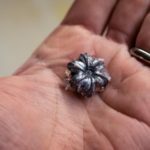 But again, I’m no ballistics expert, so I’ll leave it to you to examine the information I gathered and decide for yourself whether the new Sig Sauer Ammo is something you might want to try out.